He was born in a South Indian village named Chettipalayam on 22 December 1914. In 1949, he was ordained as a monk by Sri Swami Sivananda, founder of the Divine Life Society in Rishikesh. His achievements include the founding of Satchidananda Ashram-Yogaville, a spiritual community in Virginia, USA; and was responsible for the design and building of the LOTUS, a beautiful interfaith shrine dedicated to the Universal Light. Swamiji was not limited by any particular faith, group, or region. Dedicated to the principle that “Truth is One, Paths are Many,” he went wherever he was asked to serve. Swamiji was a pioneer in the field of ecumenism (inter-faith) and is a guiding light for millions of seekers around the world. 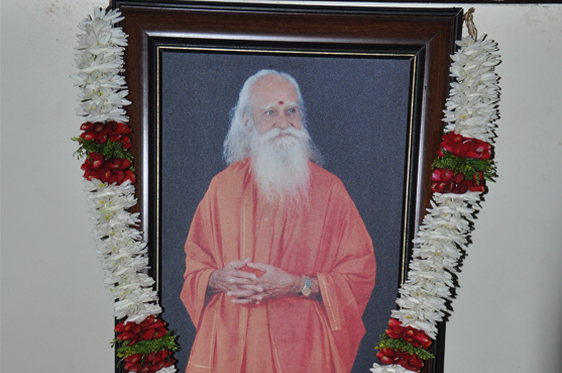 He has authored many books and was the founder and director of the Integral Yoga Institutes worldwide. He sponsored and spoke at ecumenical symposiums, retreats and worship services all over the world. He was honored with Albert Schweitzer Humanitarian Award and has been recognized for his peace-building efforts worldwide. Swamiji opened the Woodstock music festival, and he taught Yoga to an entire generation of Americans. Through his disciple, Dr. Dean Ornish, he awakened the worldwide medical community to the healing power of the yogic approach.